Yesterday, Ducky and I went over to the little dog park near our house to meet up with Casper and his mama. As it turned out, the place was crowded – it was a warm, sunny day – and all the strangers around were overwhelming for Ducky’s anxieties. When Kayla and her hubby arrived and she got out of the car, Ducky started barking at her. She was wagging her tail tentatively. It was as though she wasn’t sure if this was truly her friend or not. Then Kayla got Casper out of the car. And instant recognition. After a super-happy, tail-wagging greeting between the pups, Ducky went to Kayla and put her front paws on Kayla’s knees and was rewarded with a big, loving, hello rub. I could see the joy in Ducky’s greeting. After the greeting was over with, we decided to come back to my house for the pups to play in the ballfield across the street. But when we got here, the field was drenched in hot sun. So, we came around to the shady back yard. I had the hubby come out to get my wallet and keys – and to meet Kayla and her hubby – and then unlock the gate. He brought Shadow out, too. Brad left to go visit his grandmother while we girls chatted and watched the pups play. Well, Casper played “hard to get” and my girls played. A few times all three of them ran the fence with both neighbors’ dogs. And chased each other along the fence line. Poor Shadow had a hard time keeping up with the youngsters, but she tried her hardest. The whole time we were out here, both Kayla and I had our phones handy. And here comes the shaming part. Neither one of us thought to take even one picture! 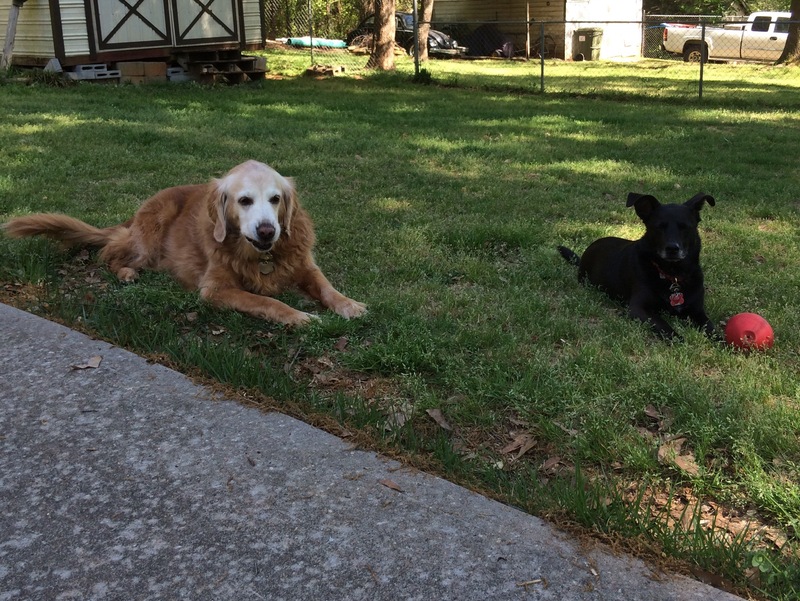 So, here’s a picture of Shadow and Ducky….